This event never spawns, I've camped there for hours. 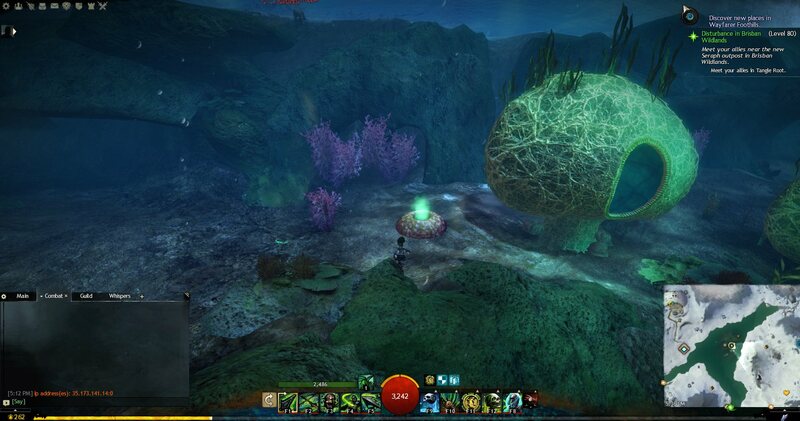 This bug is also reported on wiki (https://wiki.guildwars2.com/wiki/Clear_the_poisonous_urchins_from_Lashoosh) since september 2017, please fix it. For more info: it's an event who should take place at Lashoosh, slightly east of Isenfall Waypoint in Snowden Drifts. It would be cheaper to buy the precursor than to make though. I don't care much about the difference in price (especially in case of aquatic ones, since they're cheaper anyways), I do them because I like the scavenging hunt aspect....providing they're not bugged ofc. I looking for this event too and I see everytime some other people, who are waiting too. The event don´t restart and I send a bug report, but it don´t change something. Rage isn´t a weapon which is popular, but I like to do the achivment and if it is imposible to do the event, then they should take this event out or rework the achivment. I read in another forum, that if gw2 gets an update where they refresh the maps the event works. This event doesn't even pop up. I was waiting 6 hrs straight, trying to join another version of map in meanwhile. Would be great if ANET restart servers once per 24hrs, so we don't have to wait whole week till next update. Or just let single maps live for 12 - 24 hrs. This would give us chance to finish collections in reasonable time. Just made bugreport for it too and I see other people waiting for it too. Same problem with Quaggan Games it seems. Too bad, that´s not working. Maybe the problem with that archivment and the event isn´t on there priority list. But I hope that get fixed, ´cause it´s very usless to creat an achivment to get the precursor and that doesn´t work. Still bugged. Camped it on 4 different IPs during the Snowden Drifts Daily Event Completer. All of the maps were bugged. So, i'm the same situation for days. It's not the only event I've found bugged, but at least the others could restart by letting them fail in some ways (agroing mobs to NPCs and so on). Leader and founder of Bloodstone Keepers [BloS] - Visit us at our website or facebook page! Still bugged and I can't predict the timing of a patch so.. no way to know if I'll ever be able to get this done, It's literally the last thing I need. Could this be the problem? This object here uses the same model as the poisonous urchins during the event but you cannot interact with it. I've seen it here every time I come to check for the event, it kind of stands out because that's the "enemy" in the event. Is it not resetting becuase of this leftover "dead" urchin model? I could finish the event at the last update. At the moment it seems to be the only chance to restart the event is a patch, where all maps get refreshed. Yeah, the event is not happening and it is blocking the completion of the achievement. Event should be in Snowden drifts, Isenfall lake @ Lashoosh poi. I'm running into this same issue, which is preventing me from completing the Frenzy collection. 7th of August, joined different instances through world boss events. Waited for an hour on several occasions. Still an issue, which is disheartening considering the date of the OP. Cant finish the frenzy collection, this event never spawns..
Can we just get the item by speaking with the npc? That event is not hard anyway and ppl just want the item, leave that event bugged forever no one cares but give ppl a way to get the item please. Submitted another bug report just now. Still not spawning. So, I've submitted a bug report in game and a ticket on the webpage. Still nothing. Webpage trouble ticket is over a week old. I know I know, it's patch day, but let's take a moment to celebrate this anniversary. On January 27, 2019 this bug continue to be present in the map. Some hours (from 9:30 a.m. to 02:00 p.m.) spent to wait something, but nothing was happend. "Report a Bug" sent in game. Without the event is not possible to complete the achievement "Frenzy III: Rage". It is not correct to obligate people to purchase the precursor Rage on the Black Lion Trading Company. On February 01, 2019 the situation is always the same. The event continues to be bugged. Another "Report a Bug" sent. On February 06, 2019 after a new "Game updates" I hoped to participate to the event, but nothing. Two hours spent to wait a bugged event. But tomorrow is another day... Another "Report a Bug" sent (nr. 03). On February 09, 2019. Another half day spent to wait a bugged event. The achievement continues to be not finished. I hope to complete it before the end of this year. February 11, 2019. Today as a daily activity there is "Daily Snowden Drifts Event Completer". From 6:30 pm to 9:00 pm I waited for the event, but nothing. I tried to log in / out to try to change the map, but the IP was still the same, so there was not enough people to create a new map instance. The final result is: the Achievement continues to be incomplete. Now the new goal is not to complete the Achievement by the end of this year, but to hope to complete the Achievement before the game is closed. February 12, 2019. Another day, two and a half hours spent waiting for ... what? a bugged event. Since it's wonderful to spend time while waiting for the event, tonight I started playing Guild Wars 1, creating a new character (GW2 in one window and GW1 in another window). First purpose: get the title "The Legendary Defender of Ascalon". February 13, 2019. Another day, two and a half hours spent waiting for ... what? a bugged event... again. But my character in GW1 continues to grow up slowly... one level per day. Good night. February 14, 2019. Another day, two and a half hours spent waiting for ... what? a bugged event... again. But my character in GW1 continues to grow up slowly... today level 7. Good night. February 16, 2019. Another day, hours spent waiting for ... what? a bugged event... again. But my character in GW1 continues to grow up slowly... today level 8. Bye bye. I hope that someone in ARENANET with balls is able to make a decision and solve this problem. Looking on the internet I found that the problem with this event is known since 2012 (https://forum-en.gw2archive.eu/forum/support/bugs/Bugged-Event-Clear-the-poisonous-urchins-from-Lashoosh ). Apparently the only solution found is to wait for a patch and, immediately after logging into the game and hope for good luck. It is comforting to know that the suppor knows the existence of this problem for over 7 years and throughout this period they never find a definitive solution. Change event? too easy? better to stay still and do nothing and hope that players do not break too much with "bug report" for this legendary minor weapon. In any case I will continue to send "bug report" every day I can and write on this forum, just to vent my anger. If in ArenaNet nobody has the power to solve the problem, ArenaNet should send to each player the resources to complete the achievement. Why do I have to spend coins in the Black Lion Trading Company and not earn achievement points? @Master Childman.2135 I wanted to bear it and continue to stay quiet but I've had enough of your notifications every day for a pointless daily report on this bug and your progress on GW1 (because a thread-maker gets a notification for anyone who posts in his threads, which is not usually a problem except in cases like this one)....curse me for creating this thread. I encountered this bug as well so I sorta know how could you feel, but you crossed the line and from my experience I can assure you this: no Devs care about this bug, it will never get fixed no matter how many times you post! Now I'll tell you what you have to do. 1. Your best bet in avoiding this bug is to look for the event RIGHT AFTER a patch, that's your only chance. 2. Stop posting your daily reports, or let them be at least weekly or molthly but NO DAILY. 3. If you really want to continue with your daily reports, PLEASE do so by editing your first post instead of making new ones (which is also against the rules if I remember correctly). 4. Since I'm quite pissed off, if you continue with daily report posts, I'll delete this thread. I don't want to look rude but you were really starting to annoy me so I really had the urge to vent a bit, however point 1. is how most people (me included) did this event and that should be your aim too if you want to complete it. Good luck! What is due is due. This evening at 8:30 pm I logged into the game (I had left my character at Isenfall Lake Sunday evening) and I immediately found myself in the event that I have so much criticized in recent weeks. The event ended without any apparent anomaly. No patches were released today and no Daily Events activity was planned on this map. Therefore the theories elaborated up to this moment are not the only solition. A good dose of luck is recommended. However FYI, it works as long as you are in a newly created map where the event has not been completed yet, either by chance or by the release of a new patch but the latter is more reliable (less RNG involved). The bug is that the event fails to restart after it has been completed once. Finally anet have fixed this long term bug... I encountered this event twice today... and finish my Frenzy III collection now... Yeah~~~!! !